The COA Latinos Unidos Student Club was honored with an Award of Recognition at Oakland’s City Hall Cesar Chavez Celebration. 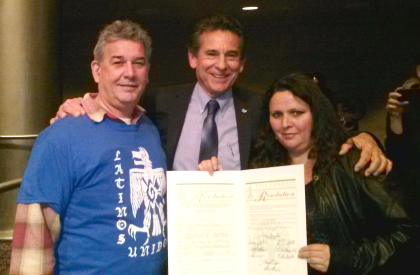 It was presented by Oakland City Council-member Mr. Noel Gallo to LUSC President Maria Margarita Pinella Meneses. The Oakland City Council members recognize LUSC efforts to uphold many Cesar Chavez’s values as listed on the award: Acceptance of all people, celebrating community, knowledge, service to others, a preference to help the needy, and determination. The LUSC continues to be very active and is continually seeking new members to help bring multi-cultural events to the COA campus, network with other active Peralta District campus life groups, collaborate with the community to perform charitable works projects and raise funds for scholarship awards.